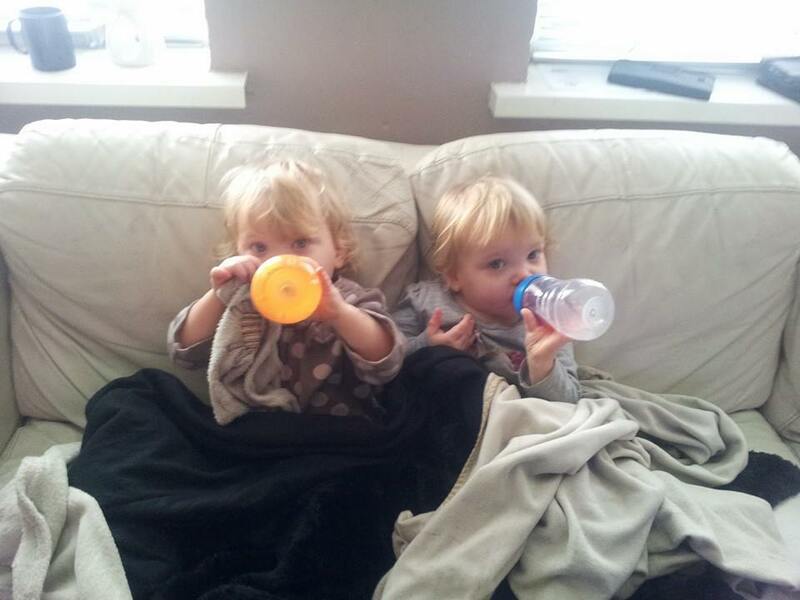 Its the twins birthday today, cannot believe they are 2!!! Time sure has flown but then we have hardly had time to sit around with these two, they have kept us on our toes since day 1. As its their birthday I have been thinking a lot about their birth and the last 2 years, realizing I have never really told anyone the full story as it had always been too hard and figured people wouldn’t want to hear, but as you lot get to choose whether to read this or not I will let you make your own minds up lol. Fast forward to just after Xmas, I had a good pregnancy, no scares, wasn’t too huge, managing OK until the first school run of the new year. I was walking home when the pains started, I thought it was due to not having done much exercise over Xmas so I promised myself a rest when I got home. Got home made a brew and watched Jeremy Kyle all the pains were gone. Got up to do something only to find I had wet myself, annoyed I went to change but the more I walked the more it kept coming, I knew exactly what it was and then the pain kicked in again. 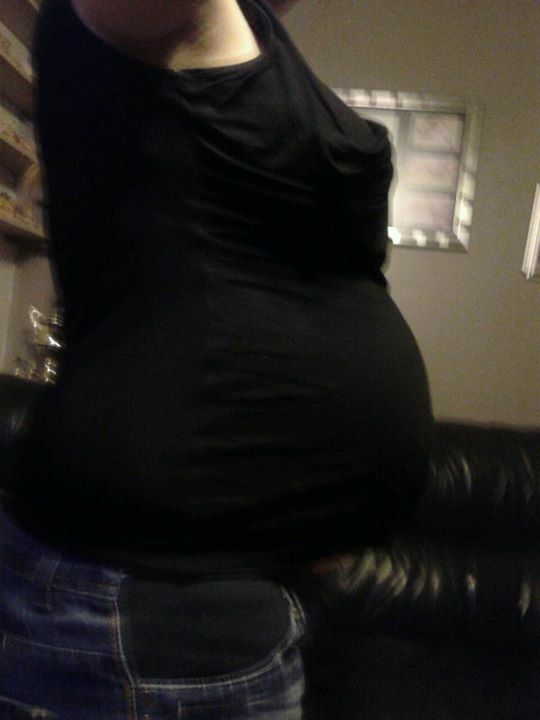 I am only 29 weeks how can this be happening, its too early? I called Tom, my mum and the hospital and off I went. I was taken into a side room and examined, at first it was just the usual type and then next thing I noticed the Dr had a torch on her head and was really looking, now I was really worried, to need that she must have found something. She explained twin 1s waters had gone, I was 4cm dilated, in labour and twin 1 was footling breech and being so small her feet could fit through my cervix already. They gave me steroids and muscles relaxants as well as a drip as I was dehydrated and it can help build the babies waters back up if the hole in the amniotic sac repaired itself. It was the scariest 48 hours of my life, I wasn’t ready and they weren’t ready, I knew nothing about premature babies but I knew this early was not good. I was watched closely during the night as my heart rate was so high the monitors kept alarming as I was tacycardic and they couldn’t tell it apart from the twins. The Dr examined me and said that my cervix had closed and twin 1 had moved to being breech so we could go home, I had to drink lots of water and eat lots of protein to try and build twin 1s water back up. Exactly a week later I wake up to a soaked bed, exactly what I feared, twins 2s waters had gone now as well, we rang the hospital but was told as I wasn’t in labour I didn’t need to go in and just stick to the weekly consultant appointments. 2 days later I have bad back ache I put it down to not being allowed to move unless I was going to the loo or bed. Wrong!! I woke in the morning wanting to push, I walked round and no contractions but had the overwhelming urge to push, I stopped myself and went to grab a drink, as I sat down the biggest contraction ever hit me, I was in labour again and it was laying or standing easing the contractions to nothing more than an ache but when I sat it was agony. We got to the hospital and was taken to a delivery suite and hooked up to the monitors and just like home as soon as I laid down it all eased up, the contractions didn’t show on the monitor and my tummy wasn’t going hard so the Dr scanned me and just as we suspected neither baby had any water around them except a tiny pocket on the top of twin 2s head (which comes in handy later). The Dr said the pain is probably because their is not much of a cushion between me and the babies so it is causing me pain (turned out I did gain 2 cracked ribs at some point) so he said if nothing happened by 5.30 I could go. At 1ish the midwife gave me some pethidine telling me it would relax me so I could get some sleep as I looked shattered, I reluctantly took it (wanted a drug free labour and birth) and started to doze. Tom went for a coffee and to ring everyone to tell them it was another false alarm. Half an hour went by and just before he walked back in I felt a pop, it now felt like I had a bubble sat in my cervix, it was a weird feeling but I knew it wasn’t right, I tried grabbing the buzzer but it was too far away and I wasn’t allowed to move because of the pethidine, I had just opened my mouth to shout when he walked in. I explained it to him and he laughed, saying it was probably the last of the waters welling in my birth canal and as soon as I stand up it would go but he called the midwife. She examined me then peered up and looked at me. Uh oh what was it? I started to well up and looked at Tom. The midwife informed me the bubble was actually Twin 1s bum moving through my cervix and that there is no stopping it now, the babies are coming today, then shot off to get the Dr. I looked at Tom and started to cry, I am only 30+3 weeks its too soon, they will be small and poorly, there must be something they can do to keep them in surely? I always thought babies had to be born after your waters had gone but I was wrong about that so perhaps the midwife was wrong about them coming today. Tom calmed me down and told me he knew I could do this and we had to be strong for the babies, the more I stressed, the more they stressed, so I wiped away the tears and put my fighting face on, I could do this I could be brave for them. 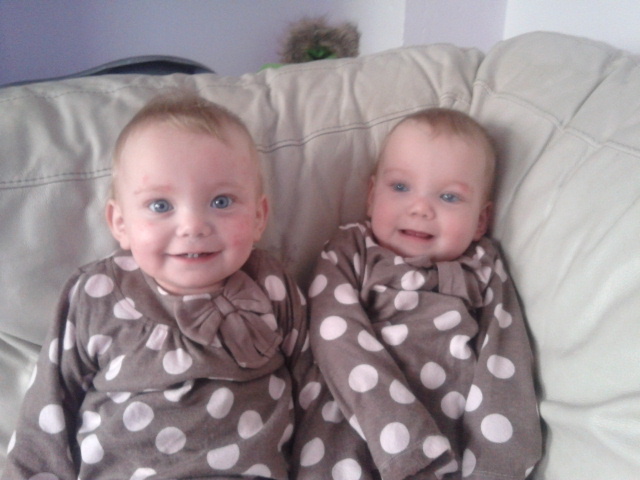 The Dr came in and told me that whilst the babies were nice and calm due to their positions I had to have a section. I broke down, I am terrified of being numbed and of surgery. I was shaking and having a panic attack but I agreed. I signed the forms, put the stockings on and took the pre-meds. I was still terrified and everyone could see it. Then out of the blue the Dr said he would let me try naturally as I had had 2 previous text book births but only on the understanding that the minute something didn’t look right I would go and have section, he said he wouldn’t give me an epidural so if I needed a section I would have to be knocked out. I was relieved, even if it was too soon and the babies were in the wrong positions I was still able to have the birth I wanted. The midwife told me the pethidine would be wearing off but as it stated in my plan I didn’t want any drugs she would stick to that but if I wanted more I only had to ask. I was wheeled up to the surgical delivery suite and it was tiny compared to the room I was just in. There was me on a bed, Tom, 2 midwives, a Dr and a scanning machine and it was cramped already. I asked if I could push yet but the midwife needed to sort my drip out ready for when twin 1 was born (its something that keeps the contractions going so I could deliver twin 2) and we needed to wait for the NICU team. I didn’t really take it in all I could feel was the urge to push again. I was on my back and now I couldn’t even feel the contraction. The midwife kept asking how the pain was and I kept telling her there was none but apparently the monitor said different. The NICU team arrived with incubators and re-suss trolleys. There was a Dr and 3 nurses and we were all cramped in this time room. Looking round it suddenly hit me, my babies are gonna be tiny and poorly and I’m not going to be able to help them, they are going have to rely on these people not me to make them better. I didn’t know what to expect when they arrived, would they be breathing, what would they look like, would they cry, could they even cry yet? I was allowed to push as was the NICU team was ready, with one push twins 1s bum arrived, the Dr then made me stop as he needed to check using a scan there were no cords wrapped round the babies neck, once I was given the OK, I pushed again, it was a bizarre feeling, I had given birth twice before and delivering a baby never felt like that and then I heard the most piercing scream, I looked round then realized, it was my baby! She was actually crying!! She was held up briefly for me to see then passed to the NICU Dr whom then sorted her out, the Dr spoke to Tom but meanwhile I was delivering something else, quickly scanning me the Dr realized it was only her placenta. Whilst scanning me the Dr had seen Twin 2 was still laying transverse (sideways) tucked under my ribs and he said judging by her heart rate she was sleeping. After all that had just happened, she was sound asleep!! He said he would try to externally turn her and explained what it was. He was basically going to push my tummy around until she turned the right way. He was really pulling on my belly and digging his hands in then all of a sudden I got that feeling you get when you go over a bump in the car, it was her turning and she was now head down and the midwife told me to get ready to push. I had a few contractions but she wasn’t budging, she was comfy and wasn’t going anywhere. 30 mins had passed and the Dr told if she didn’t come soon he would have to take me for a section, I really didn’t want that so asked if there was anything else he could do, he said he could try a manual extraction but didn’t know if it would work so I said give it a try. OMG it was the worst pain I had ever felt in my life!! I didn’t quite realize what he ment but what he did mean was trying to pull the baby out by hand!! I was in agony and I kept asking him to stop but he wouldn’t, I could even see his hand on the scan!! After a few minutes of me begging him to stop, Tom threatened to punch him if he didn’t stop as this was traumatic enough for me without him ignoring me asking him to stop. The Dr apologized and said there was one more thing he could try and if it didn’t work it would have to be a section as it had been nearly an hour. He got one of the tools they use to break your waters (little hook thing) and ‘broke’ the little pocket of water that was left on top of baby’s head, as he pulled his hand away, she followed but unlike Hollie she didn’t cry and she didn’t look right, he handed her over to the NICU Dr who began working on her. He said she was having trouble breathing so was giving her some oxygen to try and help her. The Dr called my attention back to him so I could deliver the placenta. When I had done that they started wheeling Hollie away, I caught a quick glimpse of her but she was all covered up in the incubator and all I could see was her hand and I couldn’t believe how tiny it was. They wheeled me down to the ward whilst the NICU Dr stayed in the room getting Georgia stabilized before moving her, he promised as I left that if there was any news we would be told straight away if not when we got to the NICU he would have a chat and tell us what was going on. I got back to the ward and got up, showered and dressed straight away, the midwives hadn’t even had chance to make my tea and toast they had offered in the time it took me to do all that, I wasn’t hanging about, as soon as I was allowed, I was going to the NICU to see my girls. I walked over to the bed to sort my stuff out only for my trousers to fall down. I was in the maternity trousers I wore to the hospital as I hadn’t brought a hospital bag as I hadn’t even packed one and certainly wasn’t expecting to have the babies today, I was still in shock it had happened. It was a weird feeling because I was happy, sad, angry and scared all in one go. My babies had arrived, I had the birth I had wanted and planned but it was 10 weeks early so my babies were poorly and up until 10 days ago there was no sign that this was even a possibility. Tom made some phones calls and let people know only for him to get the same question, what did they weigh? Then it dawned on me as it wasn’t a ‘normal’ birth they didn’t weigh them so we had no idea. I went off and asked the midwives when they weigh premature babies and they said they would ring as down as they normally do it when the baby is admitted. I heard her on the phone and heard the weights, I was speechless, thought it must have heard wrong so waited until she was off the phone, I did hear right. Hollie was 2lb 15oz and Georgia was 3lb 1oz. That was so tiny, up until then Skie was my smallest at 5lb 12oz and everyone commented then about how tiny she was and she had to wear prem clothes for the first month! I was checked by the midwife and given the all clear to go to the ward. I couldn’t move quick enough!!! The rest of the girls NICU journey I have described in a previous post, I don’t want to go over it again today I want to remember the happiest times, not the time full of worry and uncertainty but 2 years on I can’t believe how much they have changed and grown. That day I could’ve never have pictured spending their 2nd birthday, dancing with them to Disney songs, listening to them singing each other happy birthday and watching them play together. Every time I look at my girls it reminds me that no matter how small you are you have the capability to fight, that no matter who you are you can overcome something even when the odds count against you and it is possible to move on and be healthy, happy and love life. The girls and their journey have taught me to appreciate the little things and to make the most of everything. When I am down I look at them and ask myself what do I have to be sad about, why aren’t I making the most of things, I am very lucky things have turned out the way they have and to sit their in self pity is just ungrateful and selfish and most of the time it jolts me back to real world. I am very lucky and privileged to be blessed with 4 happy healthy children and sometimes I need to remind myself of that and looking at the all of the kids but especially the twins and remembering their journey does just that. Today on their 2nd birthday!!!!! Bringing the girls home was such a wonderful and worrying thing. I was so glad to have them at home and finally have our family all under the same roof but I was also terrified. We had spent the last 5 weeks with a team of drs and nurses and monitors telling us our babies were o.k, anything slightly wrong like their tempreture dropping was picked up on and dealt with where as now it was all down to us. How was I gunna know if their breathing was o.k whilst they were asleep or if their heart rates were a bit low? I had become reliant on those monitors to tell me my babies were o.k instead of my mothers instincts, what if I missed something or they stopped breathing in their sleep? 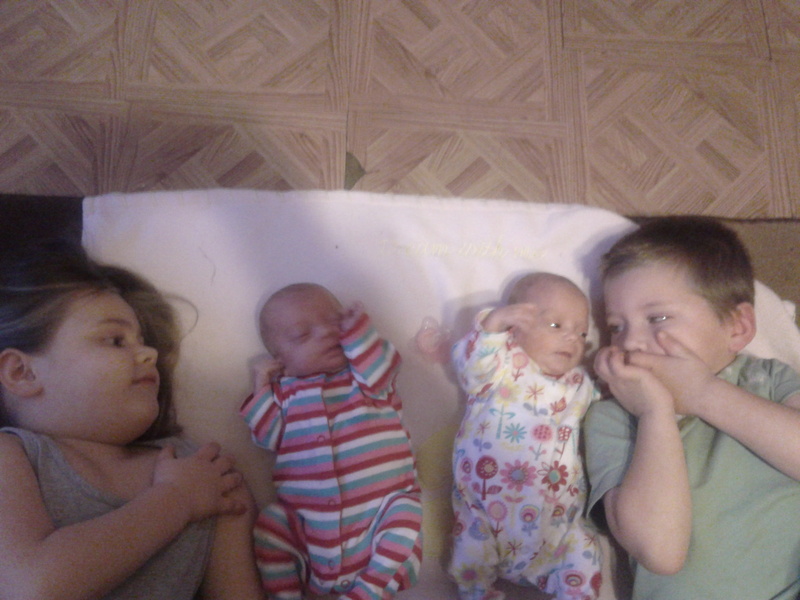 (This is common in preemies the girls did it a lot and me and Jack have always done it). We took the girls from the hospital to my mums where a select few people who knew about their discharge were there to meet them. It wasn’t until people told me how tiny they were I really noticed. 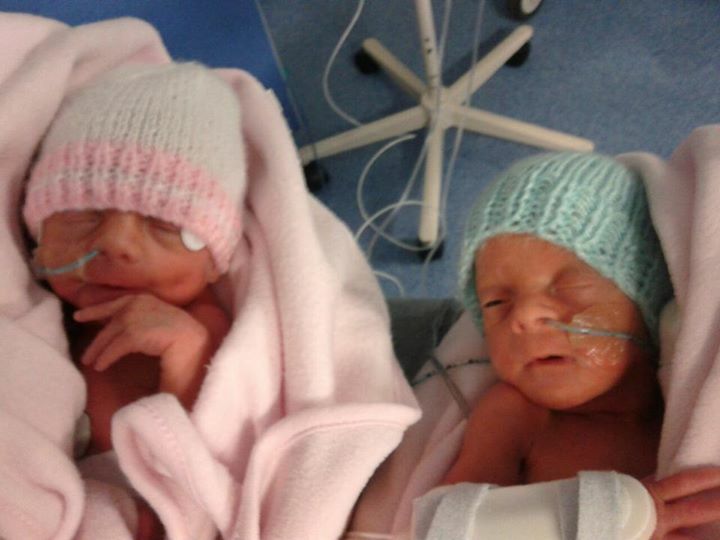 They were weighed the night before and weighed 4lb 2oz and 4lb 6oz but to me they were so big compared to when they were born I hadn’t realised how small they were compared to other babies. I was so pleased to walk back through my front door with all 4 of my kids at last. I had had everything ready for the girls since they were born as I occupied myself when I was at home by getting their stuff organised. I was advised by the hospital not to take them out in public for a couple of weeks unless essential because it was cold and they could catch something off someone else and end up back in so I hid with my babies. I didn’t leave the house only to go to the girls checkups and the kids were off school so I made the most of being able to have all my kids to myself, I felt selfish but I didn’t care, the last 5 weeks were hell for everyone and I wanted to make up for it. As the weeks past we got in to a routine of housework and school runs and to be honest I found it quite easy as the girls were so settled and the hospital had put them into a solid 4 hourly routine. For the first few months they did sleep a lot but their consultant said it was normal as they have growing to catch up on. I think even if they had been the most unsettled babies ever I still wouldn’t have complained as I was just so glad to have them home. I wasn’t bothered about getting up 10 times a night because hearing them cry ment they were o.k and it was a chance for extra cuddles. 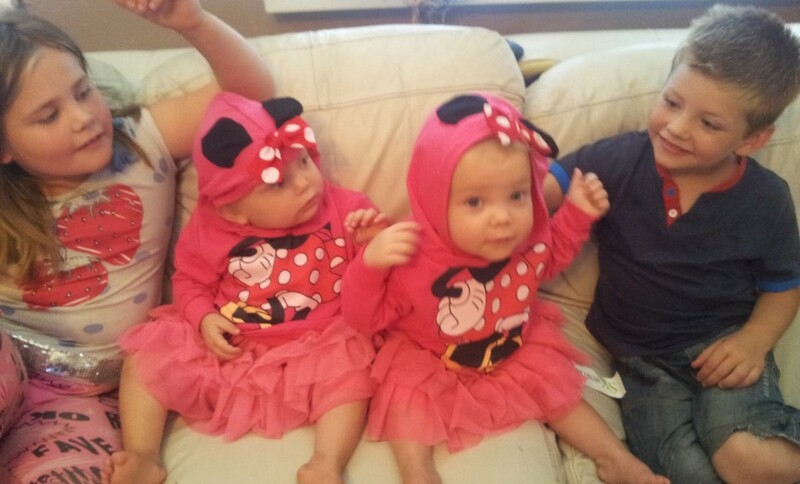 We had a good summer, they came to their first carnival with majorettes and were pushed along in procession behind us and we had our first house move to a bigger house in a different town, it was a big change but we were closer to my family and the hospital as well as supermarkets and better public transport. The girls had lots of check ups at the hospital, they were and still are under a peadiatric constultant, a physiotherapist, dietican, optician, audiologist, speech therapist, neurologist, dermatologist and now a respritory nurse so we were up the hospital a lot but as outpatients and all their reports were glowing, they were doing so well until winter came. We were warned that flu/r.s.v season could be hard and were told due to their under developed immune systems we should keep them out of the cold and away from sick people as a simple cold could make them poorly. Well flu season had barely begun before it happened. Hollie woke up one morning and was pale and limp, she wasn’t responding very much but every now and then she perked up for minute or 2 before flopping back down. Her breathing was heavy and rapid so I knew something was wrong. I debated calling an ambulance but I had 4 kids on my own how could I go? so I took the children to school and headed to the drs. Everyones oxygen saturation level should be around 100 but Hollies was at 89 and dropping, at the time I didn’t know what it ment but the dr told me she needed to go to the hospital and she didn’t want me leaving the surgery until someone got me to take me there. My mum and dad came and got me and we headed off. When we got to the hospital we were taken to the assessment unit and once the nurse did Hollies observations put her on oxygen. Her sats still weren’t rising and she was getting less responsive so they turned it up as much as they could but still nothing. It all happened so quick, in the 20 minutes we were there it had gone from 1 nurse filling out forms to 3 nurses desperately trying to get Hollies sats up, it was so scary, I had no idea what was going on all I could see was the monitor showing Hollies sats in the 80s and slowly dropping despite the oxygen. What was wrong with her? She went to bed fine, no signs of illness, slept through as usual, what happened overnight? Suddenly we were being moved. I was on my own as mum had to leave and Tom was still trying to get out of work so i grabbed Georgia who was in her car seat and tried to keep up with the nurses pushing Hollie. We got to another private room that had lots more equipment in and had the signs and leaflets with HDU written on them. I realised this was bad, she was really poorly, for us to be in this room it is more than just a cold, my baby was really poorly and I couldn’t do a thing. A dr arrived a short while later and put canulas in both of her hands and she had a feeding tube as well as another type of oxygen. The whole time this was going on I was just sat in a chair cuddling Georgia who was soundo. I was completely useless, I couldn’t even get near Hollie to comfort her as there were so many drs and nurses round her. The nurses kept telling me as soon as they have stabilised and sorted her the dr would explain what was happening. I heard odd words like infection, menningitus, rsv etc but had no idea what they were on about, all I knew is that she is really poorly and that is not just a cold. What had I done? What had I exposed her to for her to get this ill this quick? I had tried so hard to keep them away from sick people, no one was allowed to lean in the pushchair and touch or breath on them, no one was allowed round if they had a cold or flu in the last week. I had tried so hard to protect them and I had failed. 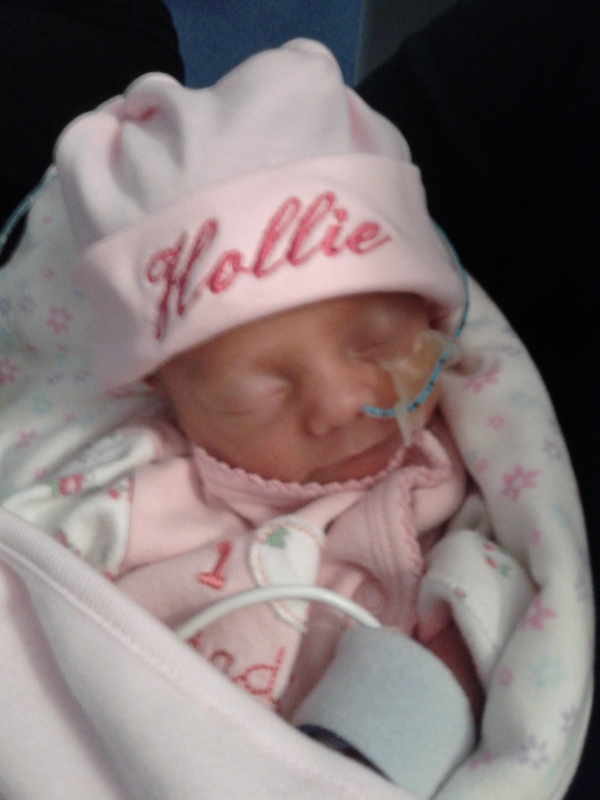 Hollie was trying so hard to breath she didn’t make a noise about being poked and prodded or having tubes and cannulas fitted, she just laid there occasionally opening her eyes and looking at the drs and closing them again. I was trying so hard to keep it together, holding Georgia as close as I could, trying to hold back the tears only to be failing miserably and silently crying all over the top of Georgias head. I was terrified and had no idea what was happening to my little girl. After a while all the nurses and drs disappeared apart from one and he explained what was happening. He apologised for not keeping me more informed but stabilising Hollie was priority to start with. They weren’t sure what was wrong with her but had sent off blood cultures and done blood gases and other tests to find out. She was having to try extremely hard to breath and it was using up all her energy hence why she was so lethargic. He explained she was now on optiflow oxygen which is the first step of ventalation as wall oxygen wasn’t having any affect as she was trying too hard still. 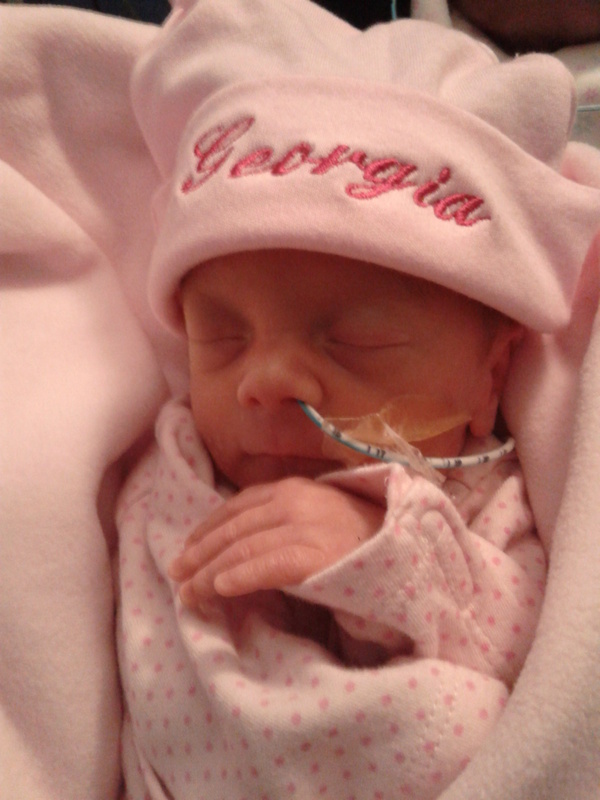 At the moment she was on the highest settings of the optiflow which was 10 litres and 80% and if this doesnt help her the next stage would be CPAP (what Georgia was on when she was born). She was now nil by mouth as a full tummy would put pressure on her lungs and make things more difficult so she was back on TPN fluid as well. They would be keeping a very close eye on her and seeing how she goes. He told us to expect to be in around 4-5 days at the very least so we might want to make arrangements for home. He reassured me none of this was my fault, it was a preemie thing and it is common for preemies to be hospitalised over their first winter as they just can’t handle the germs and bugs that come with it. He left us in the room and I just sat there staring over at the cot. What the hell had just happened in the last couple of hours? I was sat in my front room not long ago getting everyone ready for school, now I am sat with the girls in hospital with Hollie seriously poorly having a machine doing pretty much all her breathing for her. It felt so surreal, like I was watching it on t.v. Georgia had dozed off so I put her in her car seat and went over to Hollie and as soon as I saw her I broke down. She had tubes taped to her face going up her nose, cannulas in each hand with socks over the top of them so she didnt chew them and she had a sats monitor on. She was so pale she was almost transparent she looked so ill. She opened her eyes and looked at me, give me a little smile and closed her eyes again. I was a wreck, what had happened to my little banshee baby that can scream at a extrodinarily high pitched and then laugh her head off? I rested my hand on her tummy and leant over the cot and laid my head next to hers and sang twinkle twinkle as that was her favourite, she moved her head to look at me and briefly opened her eyes again. I carried on singing, stroking her hair until I could tell she was asleep instead of just resting, I covered her with a blanket and left her to sleep. 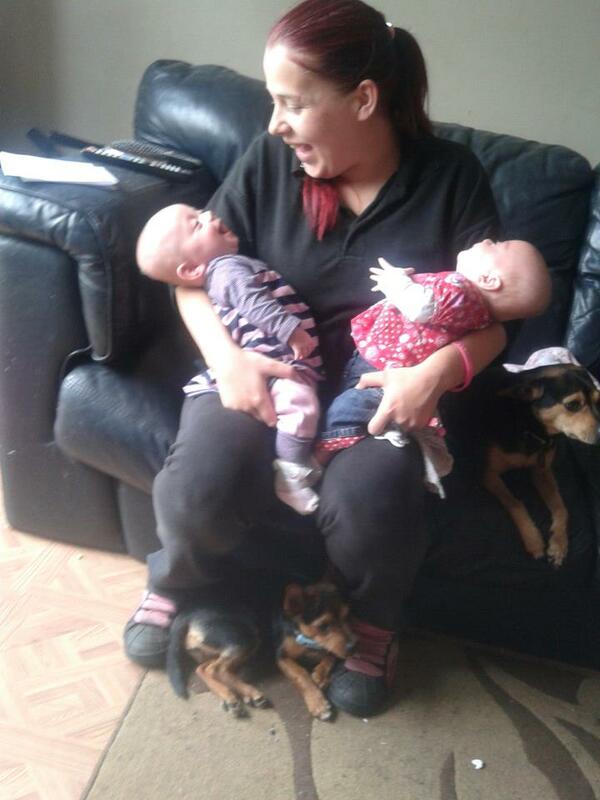 I rang everyone to fill them in and sorted out the arrangements for the other 3 children as I was going to stay with Hollie until she came home. We went through the rest of the day and night uneventful, nurses would come in and do her obs and check the machines and go off again. Hollie pretty much slept the rest of the day, it was like she had gone into hibernation so she could get better, which was a good thing because she would recover quicker like that than screaming her head off using up energy on that instead of breathing. Tom spent all of his time he was there sat next to her cot or cuddling her, I at least got to see her go through the transfomation she had made with the tubes and wires whereas the last time he saw her was last night when her and Georgia were crawling around the house causing trouble. He felt so guilty for not being here but he had to get out of work then sort everyone clothes and that out at home before coming. There was nothing he could’ve done anyway and all that would’ve happened was him getting stressed because the drs weren’t telling us anything and that would’ve added more stress and tension to the situation. Hollie made a slow recovery over the next few days, having the optiflow reduced slowly, her oral feeds slowly reintroduced and increased and the course of I.V antibiotics were nearly finished. My baby was started to get better, by day 4 she was spending most of the day awake trying to pull the tubes out and using her front teeth to shred the bandages covering her cannulas. By day 5 she was back on wall oxygen but only a little and she was certainly back to her old self. We were moved on to the main ward as she was well enough to and she enjoyed watching the other children and got annoyed she couldnt join in as she was attatched to too much. On day 6 they took her oxygen off and monitored her to see if she needed it. Whilst she was awake she didn’t but as soon as she was asleep she did (which now we have been a few time we know is normal for her) so we had to stay another night to see how she went. She needed oxygen wafted round her from a tube but not up her nose so me and the nurses had our fingers crossed we would be discharged the next day. The drs agreed she could go home and had put all this down to a chest infection and pneumonia and told us there was nothing more we could’ve done to prevent it and just to keep doing what we had been. We were finally going home after 7 days of being there, in 7 days Hollie had gone from seriously ill to back to her old self, I had felt about every emotion going and cried more than I ever had before but we were going home and wouldn’t have to go back, or so I thought. 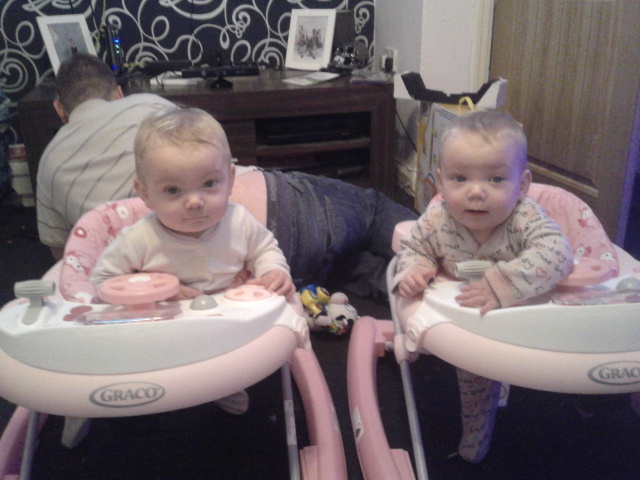 In total Hollie has had 9 hospital stays in this last year and Georgia 2, on the 2 occassions Georgia was in I had both of them in and poorly, one of them Hollie was as serious and just like I have described and the other they both had rotavirus and that was just messy more than scary lol. Hollie has now been diagnosed with chronic lung disease and asthma and Georgia with asthma. Both of them suffer with hayfever and allergies all of which cause respritory reactions and have been the reason for a few of the stays. It is winter now and we have already had 2 admissions so far, we are ready and prepared this year, we know what to watch for, when to worry and when not to and we now know all the staff up on the peadatric ward and feel safe in their hands. When we go there now instead of a scary, clinical place, we are greeted like old friends by drs, nurses, cleaners and even other regular patients and their parents we have got to know. As much as I hate to say it that place has become another home for us, it feels like another home, I know it as well as I know my own house and when we are there we are treated like part of the furniture, which I like because it takes the scary, panicky element behind being there. I know why we are there and that it is serious but I also know we are in safe hands and they will do all they can to help my babies when I can’t.